I'm coming back to the scene of the crime, if that crime was to have loads of fun and meet cool people, which I suppose it is nowadays, isn't it? Thanks Tony Blair. TFCON TORONTO 2018! July 13th to July 15th! I'm bringing my whole nonsense with me: NEW Art prints, plus all the classics! ORIGINAL artwork and covers for sale! (Any requests?) And TONS of freshly commissioned artwork, JUST for you! Details are below about how you can get your very own slice of Nick Roche art in what may be my final victory lap as a Transformers creator. Ulp! * Payment must be at TFCon, not in advance. * I will only be able to accept CASH at TFCon Chicago, no cards. I * You can Paypal me AT the show if you can show me your digital receipt for the transaction. * Seriously, this happens a LOT. It's not cool, and I will name and shame offenders! I'm Red, and I was interested in getting a headshot of Tarantulas with a world's okayest dad mug! I'm at TFCon Toronto both days, so I either day would be fine with me. Thank you! Hello Nick, my name is Darryl and I've interviewed you a few times on TransMissions. We've also eaten breakfast together many times (it's kind of a tradition now). I'm going to ask for something on a blank sketch cover if I could? I will provide the sketch cover and I was thinking... how about SPIDER-MAN? You do know how to draw him correct? I believe I saw something about you doing some Spider-related art. I will be attending TFcon the entire time, and I'm sure we'll be hanging out at some point. If the Sketch cover is a deal breaker... then I just don't know what I'm going to do with myself. Hey Nick! 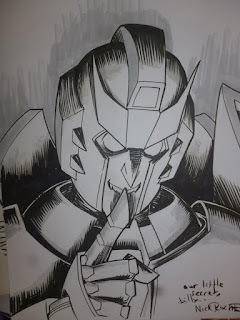 Ryan here I'll be at tfcon Thursday to Sunday and would love a Nautica commission if you have time! Hi Nick, I'm Monica (@zellezeion on Twitter if you need to get a hold of me), happy to get the chance to ask you for another commission. I was wondering if you could do a Rodimus headshot as a sort of companion piece to the Megatron with blue flowers that you did for me a couple of years ago. (Best co-captains :D) It'd be great if Rodimus could be looking to his left to bookend Megatron who's looking to his right. I would also not complain if he had a red tinge to him in contrast ;). I'll be around all 3 days. Many thanks! Hi Nick! I'm so happy you're going to be at TFCon again! I got a commission from you last year and would love to get a companion piece this year - a headshot of Prowl holding up his hand with a Lucas-the-Spider-esque Tarantulas on it/hanging from it, to go with the Tarantulas headshot with Prowl voodoo doll in a web. I'll be at the convention all day on Saturday only. Thank you so much! Hi Nick! I'm thrilled to get a chance to commission you again (last time was Chicago in 2016). My name's Emma and you can reach me on twitter @ravenwire09 if you need to. This time I'd like a headshot of Cyclonus looking cool/imposing since he was my early favorite for Mtmte and I just love your redesign of him with the gaunt skeleton face, the samurai armor, and the long horns. I'll be at TFcon all day Saturday only. 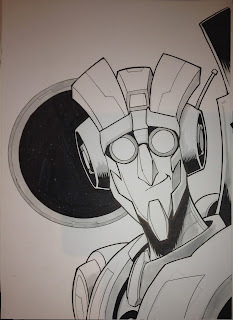 Hi, I know you are also planning on appearing at TF Nation in the UK in August; would it be possible to request a commission sketch for that? My name is Chris Bucci. I just ran across your site and, if it’s not too late, could I get a commission b/w sketch from you for pickup at TFCON Toronto 2018? I’ll be there all day on Sunday and can get it anytime. Could I get Kup with his Cy-gar? If you offer color for extra, I would be willing to pay for it. Otherwise, thanks so much. Thanks again. If it’s too late ... totally understand.